Since I became a Christian, one of the shortest verses in the Bible continues to keep me in awe. John 11:35 only says “Jesus wept.” Of course, context is necessary here to understand how powerful that is. The story unfolds in John 11:1-44. A man named Lazarus fell ill and died. 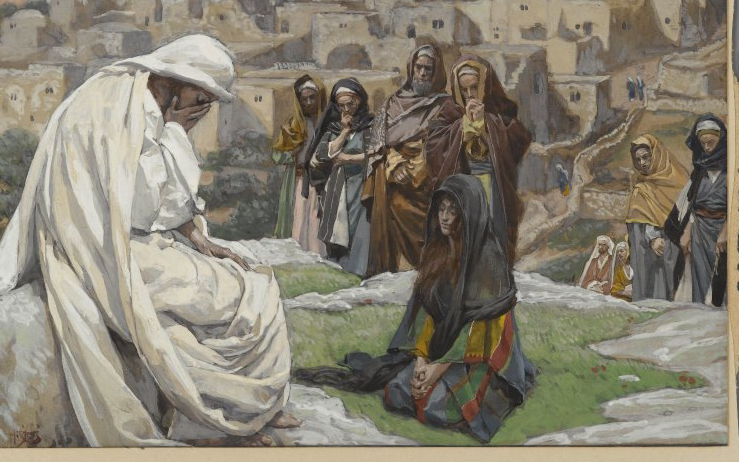 John writes that “…Jesus loved Martha and her sister (Mary) and Lazarus.” After being called for, Jesus made his way to where Lazarus had been buried for four days. While still outside the village, Mary came to Him and was weeping for the loss of Lazarus and the people that accompanied her were also in tears. John tells us that Jesus “…was deeply moved in his spirit and greatly troubled.” And then “Jesus wept.” Jesus then goes to the tomb, tells the people to move the stone entrance, and prays “Father, I thank you that you have heard me. I knew that you always hear me, but I said this on account of the people standing around, that they may believe that you sent me.” Then, with a loud voice, He commanded Lazarus to come out. And out he came. Don’t miss this. So even though Jesus, God Himself, knew Lazarus was going to come back to life, He still wept with the people. Before going to the tomb, He told Mary “Your brother will rise again.” And yet he still wept with those who suffered. Wow. If I was going to raise someone from the dead and came across their grieving family, I honestly don’t know if I would weep. I would probably tell them to “Stop crying and watch this!” like a magician about to perform his greatest trick. But that is not our Lord, thankfully. God is neither above our suffering as if He doesn’t care, nor is He below our suffering as in being powerless against it. He enters our pain; He is in it. God walks through it. He knows our pain so deeply that the all-powerful sovereign God of the universe weeps. He understands the deepest pains and longings of our hearts more than any other person could know. It does not mean we are immediately removed from our suffering, and that is worth asking “Why not?” While the Bible has much more to say about that along with many books written by the greatest theological minds (I can always offer some good recommendations), I will just comment that understanding Jesus knows our suffering means that our suffering, no matter how long, is never wasted. Jesus weeps. He has every time you’ve suffered and even when you have cried out asking where He was, or is, right now. No matter how hard you’ve denied Him, pushed Him away, ignored Him, you are not powerful enough to make Him not love you. His words speak loudly in Scripture that He is right there. It is never God that is absent in our suffering; it is our blindness and unwillingness to turn to Him in our suffering that makes Him seem silent. For me, I knew turning to Christ in suffering meant He would respond and that my life as I knew it was over. He would make me a new creation and mend my brokenness. That was very scary, it seemed impossible, and my sin and old-self did not want that to happen. I had so many questions and doubted. But His words spoke the truth and were real. The verse “Jesus wept” dwelled deep in my heart and mind. Now, in the midst of suffering, I often feel like any number of Biblical characters who have cried out “Where are you, God?” But through the suffering, I’m more like Thomas, who doubted so strongly, yet sees Jesus, touches His scars, the very evidence that He is real, and cries “My Lord and My God!” (John 20:28). Tears of anguish become tears of joy. Often in our suffering we just want someone to understand it completely, to say “I know” to us. That is what Jesus offers; He weeps because He knows.